Greetings from New Zealand, where it’s harder to find a bad bottle of Pinot than it is to find a regulated payment company with a local bank account. 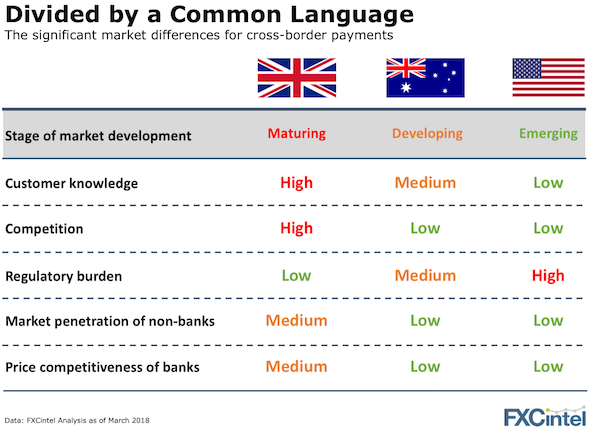 As I reflect on the many conversations I’ve had over the past week in Australia, it is clear to me how different the big three English speaking markets of the UK, US, and Australia are for consumer and corporate FX. The UK is the most advanced market, shown by the high level of knowledge customers have of international payments and FX products. Australia comes next, exhibiting many of the characteristics of the UK market circa five years ago. This has been fast tracked by the many expats who have arrived in the market already familiar with FX and some of the leading UK brands (TorFX, Transferwise and World First) who’ve set up Australian offices. The US, meanwhile, remains the least developed market. One of the primary barriers is lack of customer knowledge of FX products, which requires providers to invest in larger (and more expensive) marketing and education campaigns. To date, no startup has been willing or able to take on this burden country-wide whilst others have lost significant amounts trying. Balancing risk versus reward The first is that the risk (potential for giant AML/KYC fines) versus reward (additional income) for incumbent banks does not stack up. Unless you have a deep understanding and appetite for payment company risk (such as Barclays which was covered in our recent interview), this revenue stream isn’t attractive enough. In the US, smaller banks have attempted to fill this gap. For instance, the Community Federal Savings Bank, ranked 3,702 out of 5,839 in terms of total assets for FDIC insured banks, quietly took on Transferwise’s business and serves others as well. In Australia, the big four banks, who cover 80% of the market, are currently dealing with a range of investigations and commissions. All famously pulled out of banking payment companies, and NAB is understood to only now be softly stepping back into the market – albeit accompanied by a hefty due diligence process. A difficult competitive decision The second dynamic is the negative incentive for banks to provide a platform for their would-be competitors. FX in the US and Australia remains a high-margin, capital-light business for banks – why help disrupt that? BUT…regulatory changes are allowing more payment companies to seek e-money and banking licenses. On top of this, payment rails disruption continues at a fast pace. Specialist companies (Earthport, Ripple, Transpay) are challenging the correspondent banking model and other payment companies have set up their own banking networks (Transfermate, OFX, and others). This increased ability for companies to plot their own path outside of the traditional banking environment will inevitably elicit a response. Watch this space.